Wherever the Portuguese colonized, the exchange of ingredients and dishes was intense. Mozambique's spicy grilled chicken spread throughout the empire, becoming beloved from Lisbon to Goa, while bread is still baked everywhere throughout the Southern African country. I was also struck by how, even though the country is halfway around the world, this was one of the easiest meals to shop for, as every ingredient is available at a standard American supermarket. 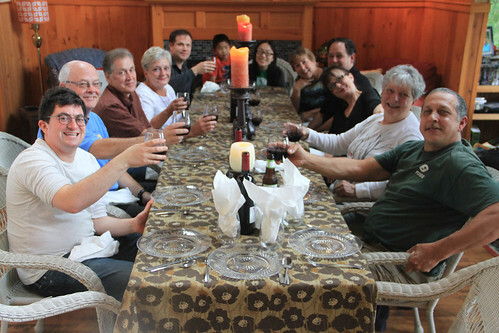 This was our second Nosh at Laura's parents' place on Anderson Island in Washington's South Puget Sound. Friends from around the island joined the table. 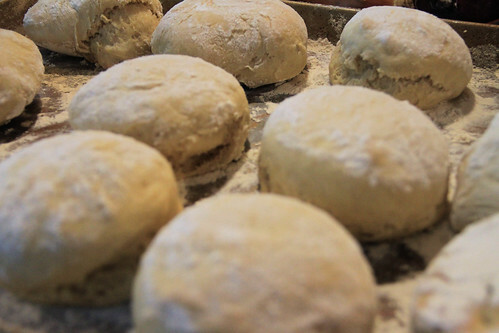 A fairly simple, moderately crusty, hamburger-bun-sized roll with a generous dusting of flour. If I'd had access to a wood-burning oven I imagine there'd have been a nice faintly smoky flavor, but as it was these were nice enough. There were many varieties of the recipe, and on a whim I went with the one that has you make a sponge with a bit of molasses before building up the bulk of the dough. We enjoyed them, but frankly I probably could have let them rise a tad longer (perhaps an extra 20 minutes after shaping), and the insides were a tad bit gummy so I should have baked them an extra few minutes. It surprised me to learn that stone fruit from deciduous trees, like peaches, can grow in tropical climates. 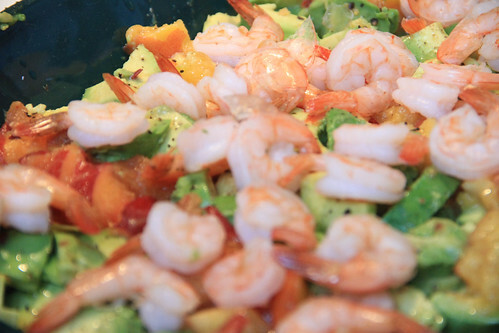 What's more, it turns out that peaches pair quite nicely with avocados. Especially with the help of a little lemon juice, there's a nice blend of flavors and textures. I don't have a recipe to link to since I threw this together at the last minute based on what I kind of remembered from other recipes, and then right before serving I decided to toss on top some cooked shrimp left over from the matapa. Piri-piri is the name of a particularly fiery small chili pepper also known as the African bird's eye chili. It's best known as the core ingredient of a hot sauce of the same name. While there are as many recipes as people who make it, I followed the basic instructions at the bottom of the matapa recipe: chili, lemon, garlic, olive oil, and salt. 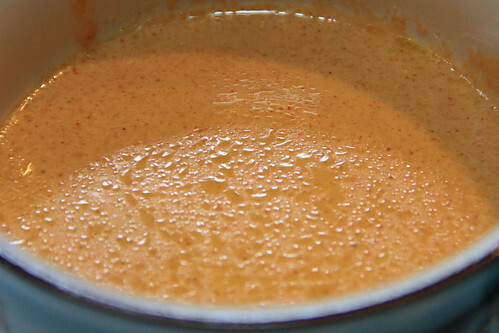 It's an infinitely flexible sauce, just add more or less of any ingredient as you like. I was kicking myself because I bought powdered piri-piri pepper in South Africa with the express purpose of using it for this meal, but left it right by the front door at home. But I used plain ol' cayenne pepper, and it worked great, which bodes well for everyday home cooks. The recipe's simple enough to write in a tweet: break apart a chicken; marinate with oil, salt, pepper, and piri-piri sauce; grill; baste every so often; eat. 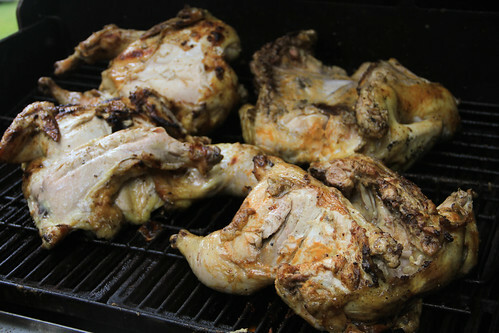 You can spatchcock the chicken, which looks super impressive but takes a good while to cook (keep your thermometer handy and check that thigh joint); for faster grilling, use pieces. My friends, this was just delicious. Thanks to a few hours of marinating, plus being cooked just about whole, it was so succulent. The hot sauce contributed a fantastic medley of flavors, and the long cooking led it to caramelize a bit and just wow. 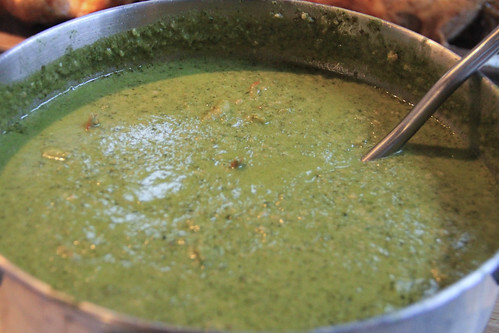 I've made a lot of African green sauce. Until now, it's been tolerable at best. This time it was so good people were taking home leftovers. The most notable difference was that instead of using frozen cassava leaves, I used fresh kale. The cassava leaves from the African market come in a solid block, and are bitter and dry. Having never seen or tasted the fresh version, I don't know how much of that is the nature of the leaves and how much was the consequence of being shipped frozen from another continent. Anyway, this preparation, with fresh greens, was really pretty good. The most clever part is making a broth from the shrimp shells, which you then use to cook the blended kale before adding the ground peanuts. Make sure to have a food processor on hand, doing the pureeing and grinding with a blender is really tedious as I discovered. This is the first potato-based dessert I've ever seen! It works, and is rich and tasty, but man, is it dense. And between the cashew, butter, and all those egg yolks, it's quite a fatty marvel. This would work plenty well as a gluten-free cake, the flour in the recipe is an almost insignificant amount and could surely be replaced by any GF flour. 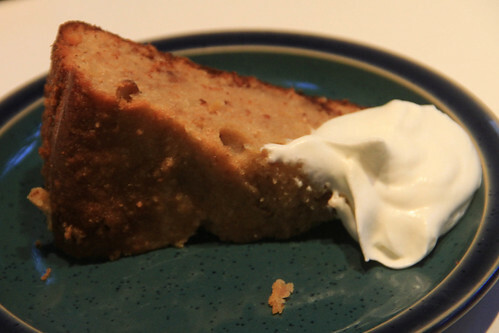 Note that it took way longer than the specified 30–45 minutes for the middle of this cake to cook through for me. If you're a Mozambican wealthy enough to afford it, you might have a taste for Portuguese wine. So that's what we drank. Otherwise, (decent light) beer and (apparently low-quality) rum are the preferred alcoholic drinks.